This is a great place with a very nice location! It is situated directly opposite the city and has a unique view! The restaurants and the city are within walking distance, and the hotel is quiet and peaceful. Great place to relax! We enjoyed every moment the splendid view of the city and sea from our balcony. The landscape was very nice, and the property was quiet, and beautifuly as well. They cleaned our room every day, so it was very clean all day. The city was very close for the night walk. The place is quiet and the upper rooms have a wonderful view of the city and harbor. You can cook in the room and have a suggestive dinner in the balcony. Ładny widok z balkonu. Cicha i spokojna okolica. Bezpieczne dojście z miasta - 1,5 km. Doskonała baza wypadowa do zwiedzania wyspy. Замечательный панорамный вид на бухту и окрестности.Чистый и аккуратный номер. Ежедневная уборка номера. Тихо. Вместе с тем, центр города и порт находятся в пешей доступности (15-20 минут). Καταπληκτικό μπαλκόνι με τραπέζι και καρέκλες, όπου το βραδύ βλέπεις φωταγωγημένη όλη την Χώρα και το θέαμα είναι εξαιρετικό,. Εξαιρετική θέα. H θεα απο το δωματιο ειναι απιστευτη!Ο ιδιοκτήτης εχει και την ταβερνα στο στάφυλο οποτε ειχαμε και δωρεάν παρκινγκ σε μια πολυσυχναστη παραλια. Καθαριοτητα αψογη, πολύ καλό wifi, και τα δωμάτια βρίσκονται σε μια ήσυχη περιοχή 2χλμ απο το λιμάνι. Κλασικα δωμάτια δε περιμέναμε κατι καλύτερο με τιμή 70+ ευρώ τον Αυγουστο. La struttura è situata un po’ fuori dal centro del paese quindi molto tranquilla e le stanze hanno una bellissima vista mare, sulla città di Skopelos e sul porto. Staff molto gentile. Pulizia ogni giorno della stanza e cambio della biancheria a giorni alterni. Lock in a great price for Nepheles – rated 8.1 by recent guests! Set on an elevated position, Nepheles offers self-catering accommodations with panoramic views over Skopelos Port, which is located 0.6 mi away. Surrounded by lush greenery, it features stone-paved terraces and shaded seating areas. Nepheles studios and apartments are traditionally furnished and have tiled floors. Each with a balcony with a table and chairs, they are equipped with a kitchenette, TV and air conditioning. All units have their own bathroom with shower. Within 1.2 mi, you can find super markets, as well as restaurants serving local specialties. Stafylos Beach is 2.5 mi away, while a gas station can be reached at 1.1 mi. Free private, on-site parking is available. 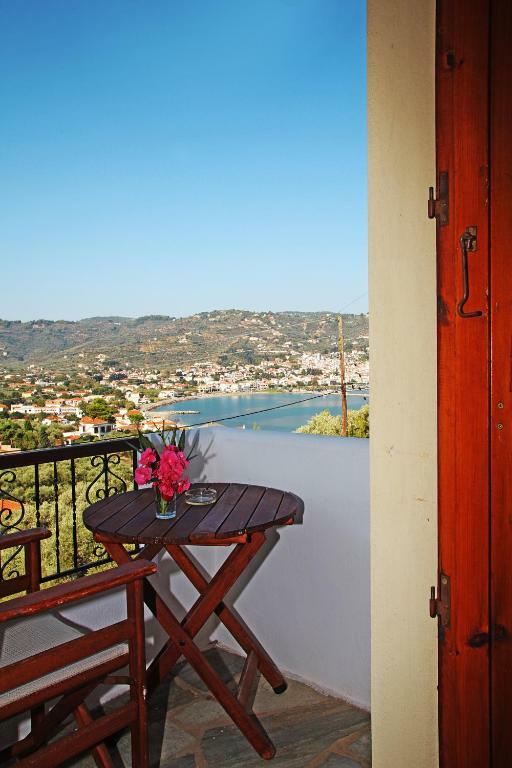 뀐 Located in the top-rated area in Skopelos Town, this property has an excellent location score of 9.0! When would you like to stay at Nepheles? 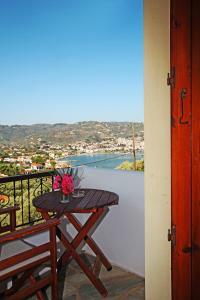 This air-conditioned studio features panoramic views over Skopelos Port from its furnished balcony. It also includes a kitchenette and a TV. Including a separate bedroom, this air-conditioned apartment features panoramic views over Skopelos Port from its furnished balcony. It also features a kitchenette and a TV. House Rules Nepheles takes special requests – add in the next step! We booked the room 4 months in advance for a 2 night stay and this was confirmed by the hotel. However, on arrival we were told we would have to change rooms after one night as they had allocated our room to someone else! Not ideal and no real explanation was given. Rooms were very traditional and a bit tired looking. Would not stay there again. The Wi Fi is weak, but that's the whole island in general. The road to arrive to the place is a little bit messy, many dangerous holes in the asphalt. Be careful of you will use a scooter. There wasn't enough kitchen gadgets for us, for example knives, spoons, and bowls.